Oh cookies, how I love thee. Let me count the ways. It’s true. I’ve never met a cookie I didn’t like. And for me, Valentine’s Day and cookies go together like mac and cheese. You really can’t have one without the other; it’s basically un-American. 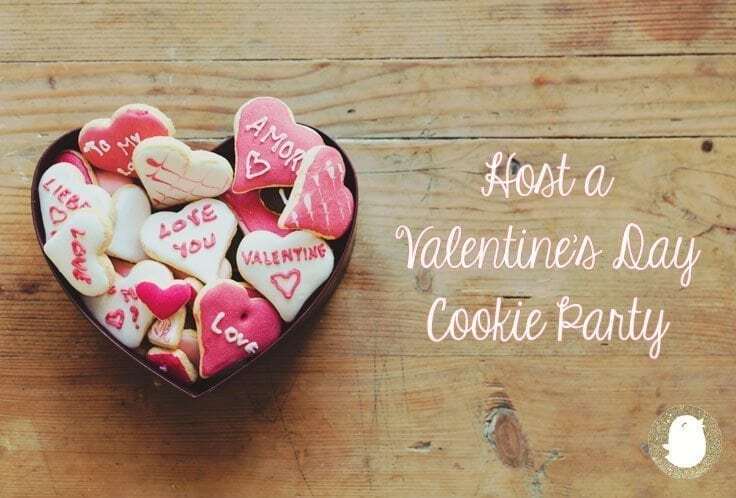 And even though we Tomes’ aren’t Valentine’s Day fanatics, a Valentine’s Day Cookie Party sounds like the perfect way to celebrate. Don’t you agree? Invite your best girlfriends and their littles over for a fun-filled and festive afternoon you won’t soon forget! Formal invitations are always optional. Especially for a gathering like this one. It really just depends upon your budget (obviously). But if you have the cash to spend, I say go for it! You can always find and order beautiful invites from a number of online vendors and designers. I found these pretties on Etsy. Aren’t they so chic(k)? Most of these designers allow you to make simple changes to the original, respond promptly, and afford you the option of DIY printing. Because seriously, who doesn’t love snail mail? You don’t have to spend major moolah to throw a killer party. Your local discount party store has awesome things for incredible prices, that won’t break the bank. Whenever I am considering spending a little bit more on party decor purchases, I try to select items I know I can reuse and recycle. Confession time: I have admired the adorable Valentine themed section of the Pottery Barn Kids catalog for many years now (even before I had children of my own). So this is a no-brainer. A cutie-pie Cookie Party is the perfect excuse to order matching (reusable) plates, cups, heart themed table runners, and festive garlands. Heart shaped balloons and streamers are a fun addition — and don’t forget to create a super cute playlist! Cookies? A must. Milk? Duh. You could even turn it pink with some red food coloring or serve strawberry milk! LOVE. Wine for the other moms is a given. (Wine is always a good idea in my book. Except when I am pregnant, of course.) Whip up a batch of heart shaped sugar cookies for your guests to decorate. Make sure you have all the fixings — frosting, sprinkles, Red Hots, the works. You could also serve mini Red Velvet Bundt cakes and chocolate covered strawberries if you wanted. Yum! The possibilities are endless. So don’t be afraid to get creative! Happy Valentine’s Day, Mommy Chicks!